For some reason the Duke stable of artists didn’t really make much use of the Muscle Shoals studios during the 60s or early 70s. There was a Bobby Bland session that yielded the “Keep On Loving Me (You’ll See The Change)” 45 but that was about it – apart from this great unknown pair of tunes. Writer/producer Harrison Calloway, then a resident at Fame, brought out the “Boom Shacka Shacka” chant that the great JT had used for on his funky version of “Steal Away” the previous year and covered “You Made Me A Anybody’s Woman” in layers of percussion over the Fame Gang’s fine rhythm. 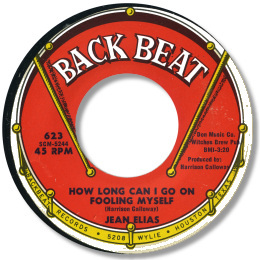 Jean Elias sounds pretty good on this cut, but she brings out a lovely bluesy touch on the mid-paced flip “How Long Can I Go On Fooling Myself”, with some superb downwards glissandos at the end of some key phrases. This really is fine music. Both sides sound like Candi Staton tracks that got away – and that’s a pretty strong recommendation.